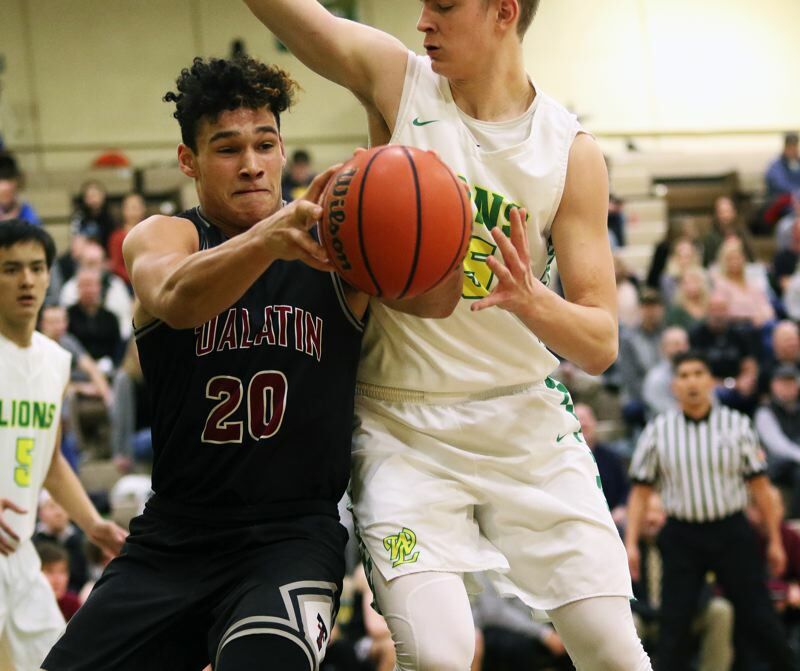 WEST LINN — During the first half of Three Rivers League play this season, the Tualatin High School boys basketball team definitely had its share of close games. But, unfortunately for the Timberwolves, they found themselves on the losing end of those close games. Well, early in the second half of TRL action, Tualatin is still finding itself battling in closely contested contests. But, now — on Friday at least — the Wolves find themselves smiling after the final horn sounds. 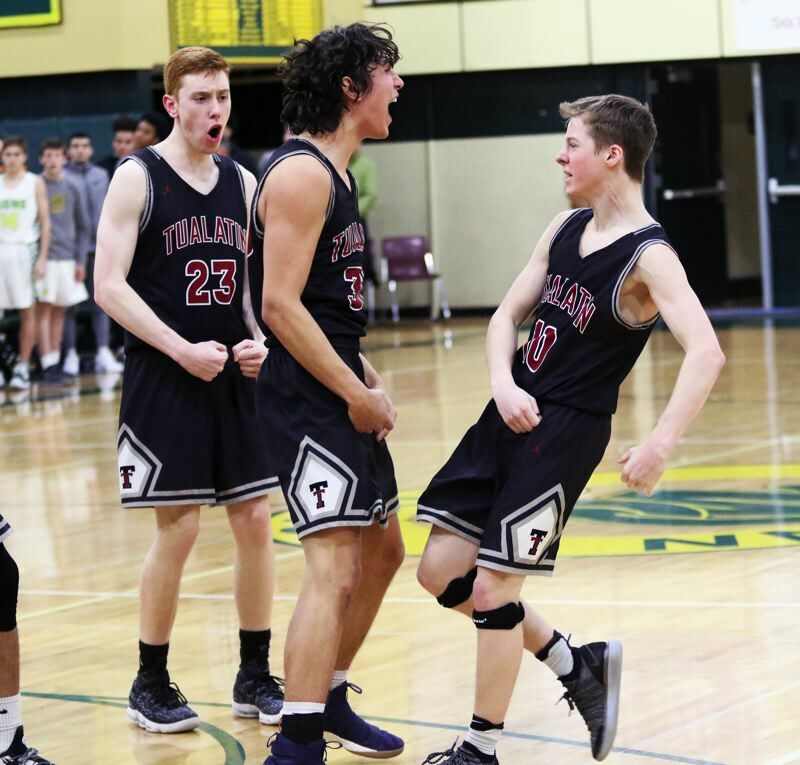 Tualatin, a week after knocking off top-ranked West Linn, rallied to get a 44-42 overtime win over West Linn in a Three Rivers League thriller played at West Linn High School. 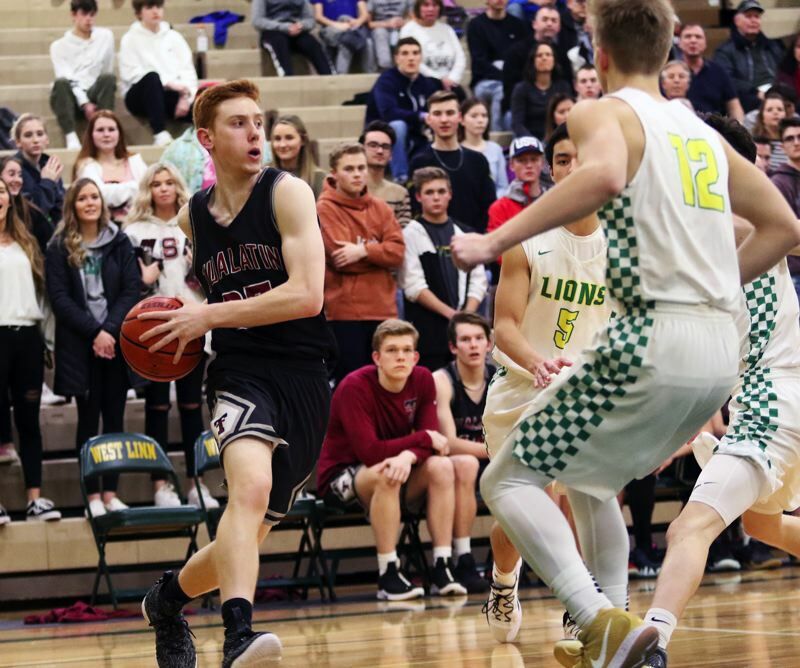 "This one is huge," said Tualatin senior guard Derek Leneve, who sank a game-winning pull-up jump shot with two seconds remaining in Friday's game. "We beat LO last week, and now beat West Linn. We're 2-0 in the second round of league, and, if we can keep this up, we'll finish strong." "Oh, it's big. 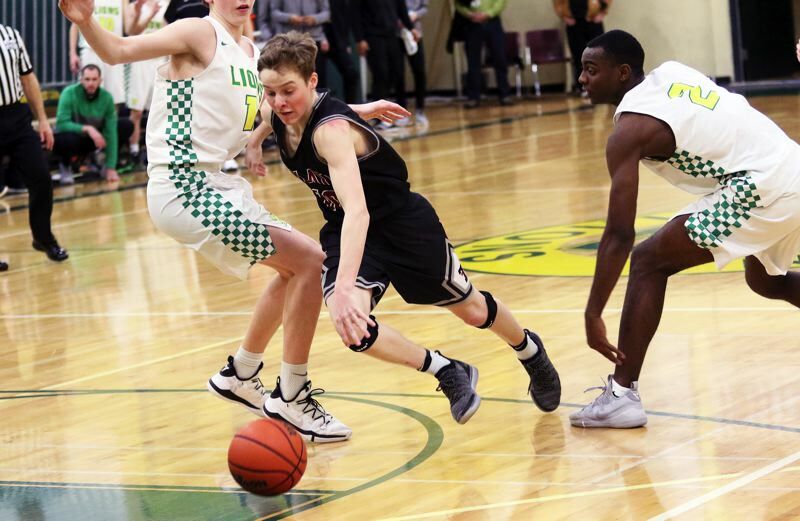 Coming off the win over LO, we're kind of showing ourselves, and everyone else that we can compete and get some wins in this league," said Tualatin senior guard Caden Dickson, who scored a game-high 22 points. "West Linn is one of our rivals, one of the teams we strive to beat. When you get a stinger like that, with a few seconds left, that's huge." With the win, Tualatin improved to 4-4 in TRL play (12-7 overall), putting the Wolves in fifth place in the league standings. 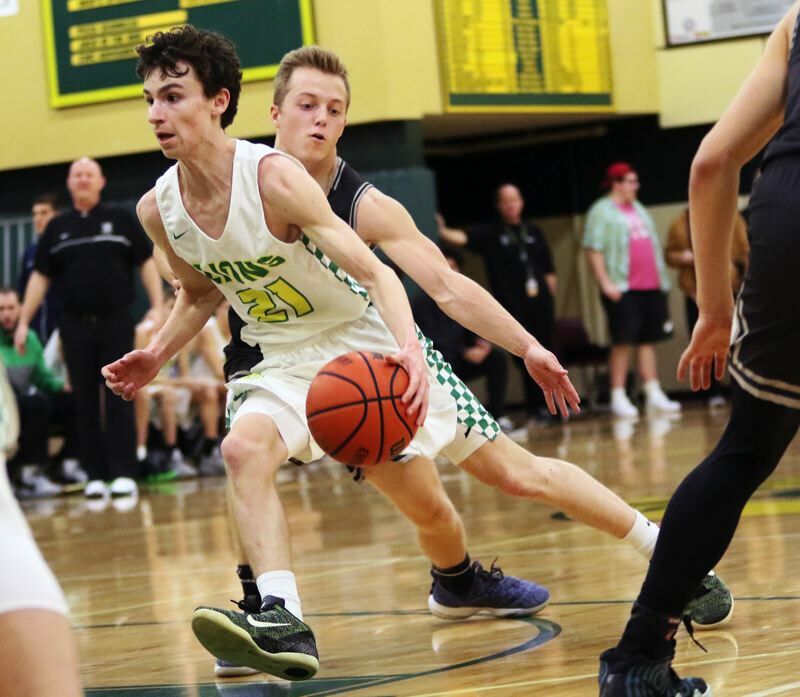 "We've had a lot of close games, we lost three games by just six points (to Oregon City, Tigard and West Linn in the first half of league play), but now we're finishing strong. We're being more solid throughout the game, both defensively and offensively." 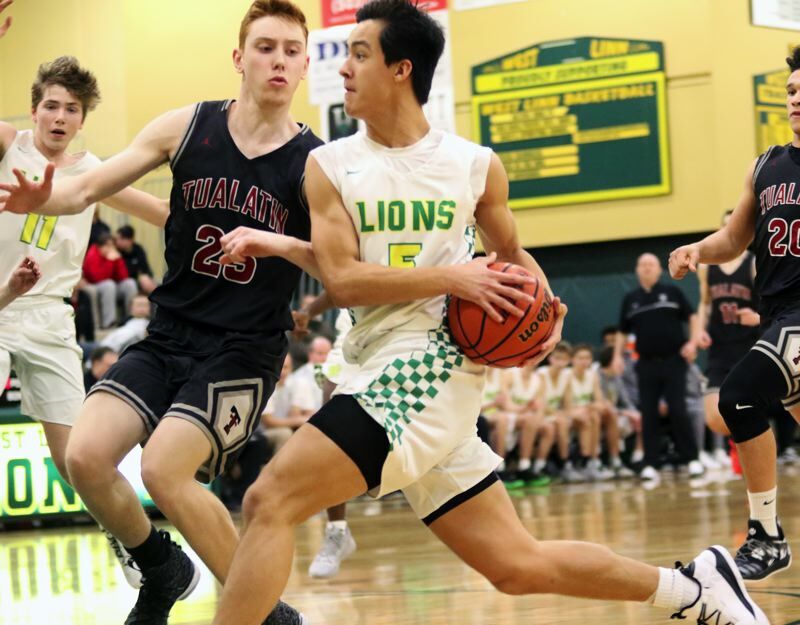 West Linn moved to 5-4 in TRL games (10-11 overall), keeping the Lions in fourth place in the league standings. "I thought we did pretty well," West Linn senior Cade Knutson said. "We had an eight-point lead in the fourth quarter, and we just gave up too many drives and kicks. They got to the middle too much, and that killed us. This game will help us out. Our league is going to prepare us. All of the teams that make the playoffs from our league are going to be a threat because of all the competition." The Lions, with Knutson scoring five straight points, and with senior Oreon Courtney scoring on a put-back shot, got off to a fast start, grabbing a 9-5 lead with 3 minutes and 22 seconds left to play in the first quarter. A 3-point basket by Dickson later in the period, trimmed the West Linn lead to 9-8 going into the second quarter. West Linn's defense continued to give the Wolves' problems at that point. "Offensively, their 1-2-2 kind of shook us," Leneve said. Meanwhile, the Lions, getting a first straight points by junior Gus Michelon and a thunderous dunk by Courtney, coming off a pass by junior Kelton Herrick, opened up a 20-13 advantage with 2:29 left in the first half. 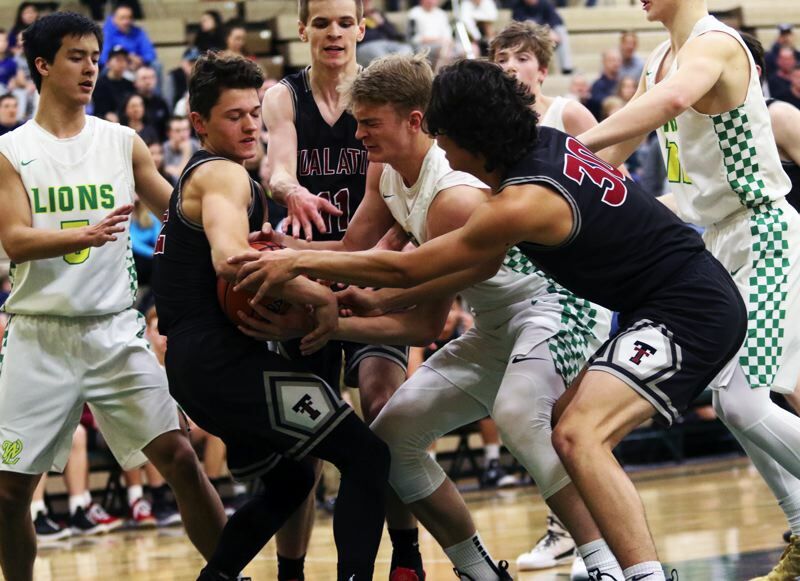 Tualatin battled back, getting a basket on a jumper by junior John Miller, off an assist by sophomore Logan Shaw, and a pair of free throws by Miller to trim the margin to 20-17 at halftime. But the Lions started to pull away in the third quarter. Michelon sank three 3-pointers in the first 6:36 of the period, junior Parker Durbin added a layup and Courtney had a free throw, giving the home team a 32-24 lead going into the fourth quarter. But the athletic Wolves rallied in the final stanza — and they did it in a hurry. Dickson opened the fourth quarter with a 3-pointer off a pass from senior Jack Rose. Then, following a steal and pass by Miller, Leneve sank a 3-pointer, cutting the lead to 32-20 with 6:23 left in the game. Tualatin got even closer, at 34-33, following another 3-pointer by Dickson, coming with 5:21 remaining. But West Linn, getting another dunk by Courtney and a reverse layup by Knutson, coming off a Durbin pass, would lead 38-35 with 2:35 left in the contest. But the Wolves would tie things up, at 38-38, on Dickson's third 3-pointer of the period, coming off a kick-out assist by senior Bridger Steppe, with 31 seconds remaining. West Linn, working for the final shot, got a 16-foot jumper with four seconds to play, but it was off the mark. But the Lions got the rebound and were fouled on a follow-up attempt with 1.2 seconds remaining. But they missed on both ensuing free throws, sending the game to overtime. "After those two missed free throws, we had some hope," Dickson said. And, in overtime, the Wolves took advantage of that hope. Miller scored on a drive to the basket, giving Tualatin a 40-38 lead with 3:38 remaining in the extra session. West Linn answered right back with a basket by Herrick, tying the game with 2:56 remaining. The Wolves regained the lead, at 42-40, on a short-range jumper by Steppe, coming off a pass by Leneve, with 2:28 left to play. But, again, West Linn responded with a basket by Herrick on a drive in the paint, knotting the score at 42-42 with 1:07 remaining. Now, it was the Wolves' turn to work for the final shot. 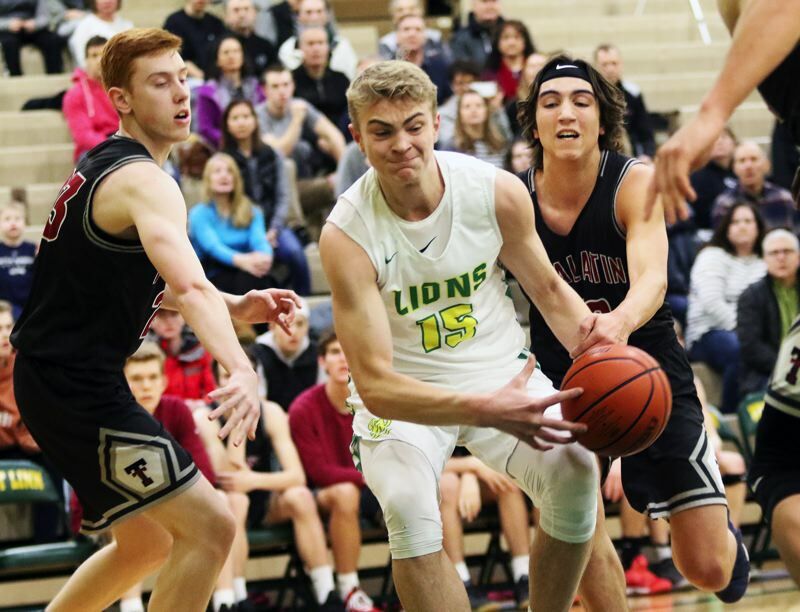 After Tualatin used most of the remaining time, West Linn, which had a foul to give, fouled Dickson near the sideline with 6.7 seconds remaining. Tualatin, following foul got the ball to Leneve near the top of the circle. 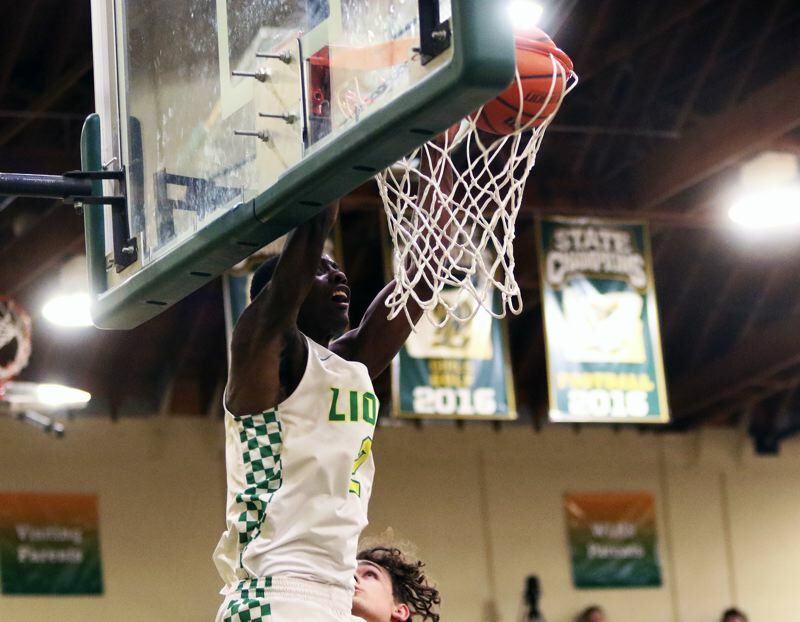 After looking to pass, Leneve drove toward the basket, stopped quickly, and sank a pull-up jumper from 12 feet away with two seconds remaining, giving the Wolves a 44-42 lead. "I know they're covering me on the 3(-pointer), because that's mostly where I've shot from tonight," Leneve said. "I know they were playing Jack (Rose) and we were trying to get it to him, so I just said, 'I'll take it.' I thought I could get behind them, and it worked out. I took advantage of a little breakdown they had. It felt good, right when it left my hand. I was pretty happy about that one." "That was big, it was huge," Dickson said. "We work on shots like that every day in practice, and when we needed him to come up big, he made it work." Following the basket, West Linn made a quick time out call, and got to inbound the ball from the far baseline with 1.6 seconds left to play. But Tualatin senior Jason Wisler leaped to steal the Lions' long inbounds pass, sealing the Wolves' 44-42 victory. 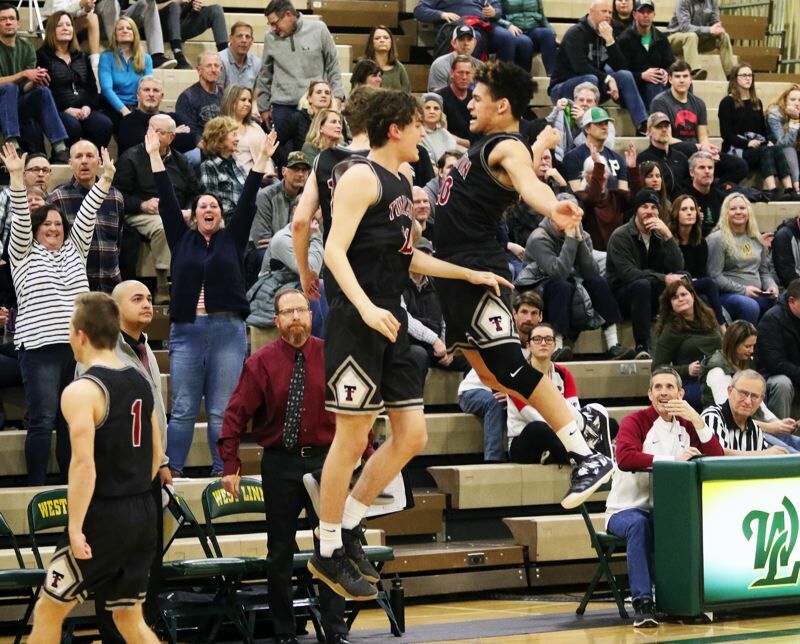 "It's been energy, and it showed," Dickson said of Tualatin's wins over Lake Oswego and West Linn. "We can definitely play with any team in our league. When our energy is super high, we can stick with these teams. This was great. It was fantastic, and, hopefully, there are many more to come." "This was a fun night, a big game," Leneve said. "To win on their court is always good, and this was the last game here for me." Dickson, who sank six 3-pointers, had three steals to go with his game-high 22 points. Miller added 12 points and four rebounds. Leneve scored eight points. 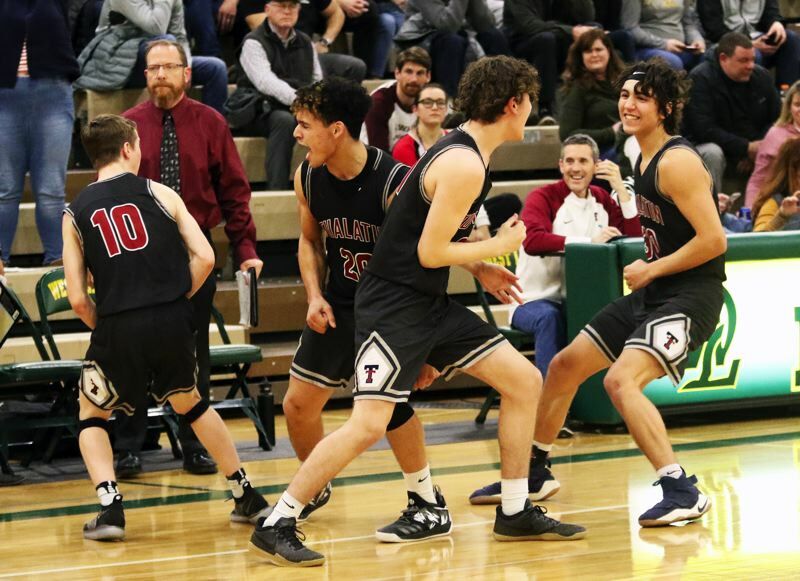 Tualatin, as a team, made 17 of 37 shots from the field, with eight 3-pointers, and two of two free-throw attempts. Michelon connected on four 3-pointers and led the Lions with 14 points. Courtney had 13 points and 11 rebounds. Knutson had seven points, four rebounds and two assists. Herrick had four points, all coming in overtime. "I thought we played well on the offensive end," Knutson said. "We've been playing well lately, we just didn't get it done today." 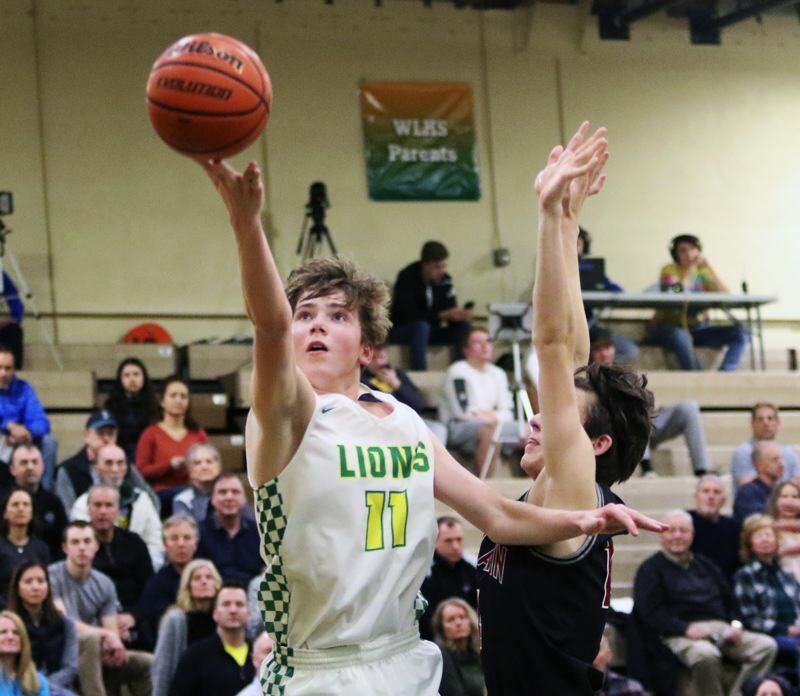 West Linn, as a team, made 18 of 38 shots from the field, with five 3-pointers, and one of six free-throw attempts. "It was fun," Knutson said. "Obviously, we didn't want to get the loss, but it was fun to battle out there. It's a battle every night. I think, going forward, we've got Canby, (Oregon City) and (Lake Oswego). Those are three really good teams." Weather permitting, both teams will be back in action with league games on Tuesday. 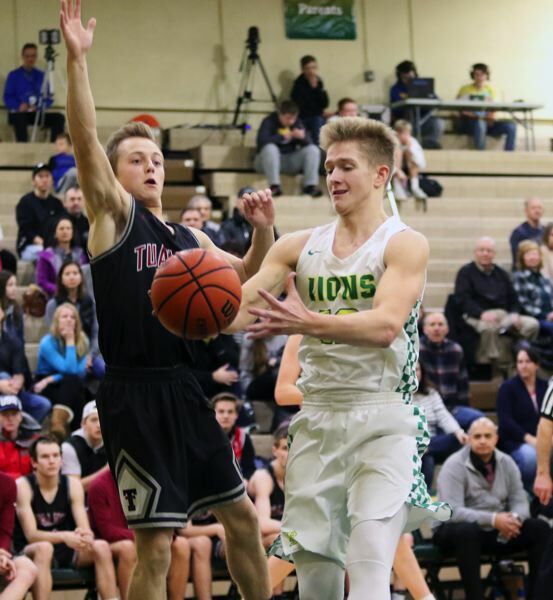 West Linn will travel to Canby for a 7 p.m. contest, and Tualatin will play at Oregon City at 7:15 p.m.